LAS VEGAS — China digital radio broadcasting in FM band, commonly referred to ad CDR, is a digital radio broadcasting standard that operates in the FM band (87 MHz to 108 MHz). CDR is a type of In-Band On-Channel system that works in the FM band. 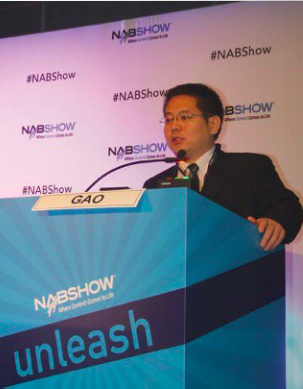 At the spring NAB Show SAPPRFT’s Director of the Academy of Broadcasting Science, Peng Chao, held a session focusing on the background of the CDR Project and the general state of digital radio broadcasting in China. The chart highlights the key characteristics of FM, HD Radio, China Digital Radio, DRM+ and DAB+. Peng Gao, director of the Academy of Broadcasting Science at SAPPRFT, speaks to the audience at the spring NAB Show. CDR’s key features include flexible spectrum utilisation modes and the capability to fit both FM and AM broadcasts. As regards to error-correction, CRD developers decided to use LDPC algorithms as the main FEC. This, says Gao, proves more powerful than other FEC system currently used in other digital radio standards. Audio compression is based on the Chinese DRA coding scheme. 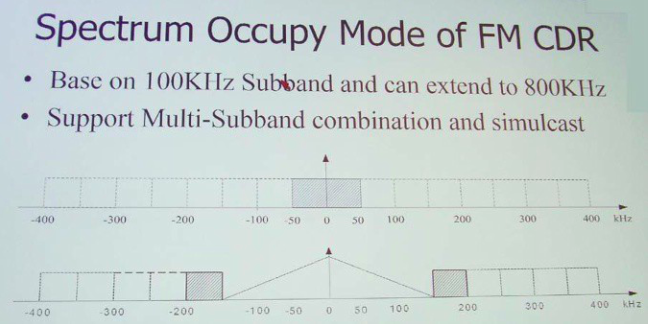 The CDR system makes use of the OFDM modulation and includes QPSK, 16-QAM and 64-QAM modulation levels analog with four LDPC code rates — 1/4, 1/3, 1/2 and 3/4. “According to our studies, CDR requests a minimum C/N ratio, which is about 2 dB lower than the C/N required by DRM systems under comparable receiving conditions”, said Gao. Audio compression in CRD adopts the latest version of the Chinese-built DRA+ codec, recently enhanced with Spectral Band Replication and parametric stereo technologies, thus matching the AAC+ v2 codec in terms of nominal features. Gao unveiled how, according to their experience, DRA+ at 24 kbps features a sound quality “near FM”, while at 48 kbps sound quality is “better than FM” and at 64 kbps with 22 kHz bandwidth sound quality is “comparable to MP3 128 kbps”. 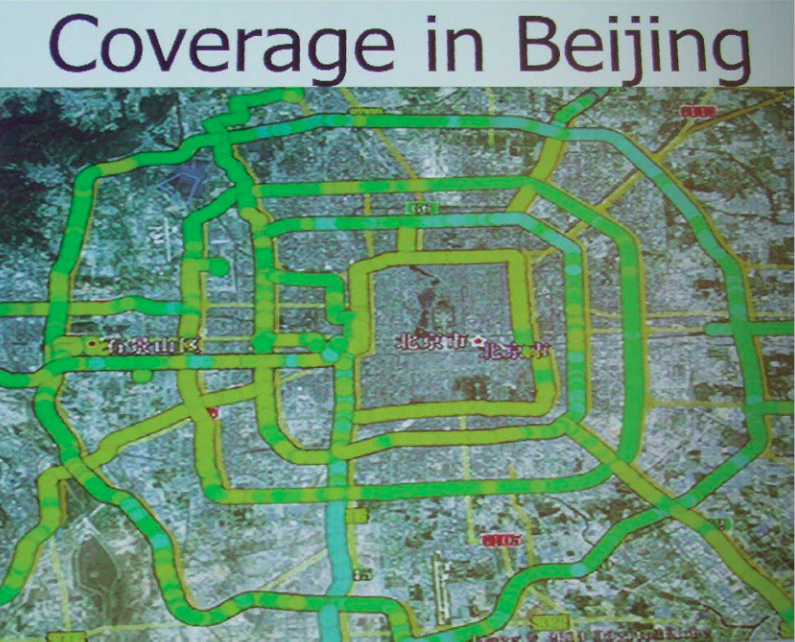 “Three trial networks are presently on air in Beijing, Guangzhou and Shenzhen”, Gao said. “And by the end of 2016, CDR broadcasts will be available in more than 560 cities.” The expected coverage at the time will span from the southern to eastern regions of China. The Academy of Broadcasting Science ran comprehensive test and measurement sessions on three networks, both static and “en roulant,” which Gao said confirmed the standard’s “excellent” QoS. With a potential market of more than 1 billion people, and a substantial commitment by Chinese authorities toward digital radio, the country may soon boast he highest number of digital radio listeners worldwide, thanks to its own “home-grown” CDR digital solution.